What is International Code for the Safe Carriage of Grain in Bulk ? The term grain covers wheat, maize (corn), oats, rye, barley, rice, pulses, seeds and processed forms thereof, whose behavior is similar to that of grain in its natural state. For the purpose of this Code, the expression “ships constructed” means “ships the keels of which are laid or which are at a similar stage of construction”. The term filled compartment, untrimmed, refers to a cargo space which is filled to the maximum extent possible in way of the hatch opening but which has not been trimmed outside the periphery of the hatch opening either by the provisions of grain code for all ships or for specially suitable compartments. The term partly filled compartment refers to any cargo space wherein the bulk grain is not loaded in the manner prescribed in grain code i.e(neither filled compartment, trimmed nor filled compartment , untrimmed). A document of authorization shall be issued for every ship loaded in accordance with the regulations of grain Code either by the Administration or an organization recognized by it or by a Contracting Government on behalf of the Administration. It shall be accepted as evidence that the ship is capable of complying with the requirements of these regulations. The document shall accompany or be incorporated into the grain loading manual provided to enable the master to meet the requirements. Such a document, grain loading stability data and associated plans may be drawn up in the official language or languages of the issuing country. If the language used is neither English nor French, the text shall include a translation into one of these languages. A ship without such a document of authorization shall not load grain until the master demonstrates to the satisfaction of the Administration, or of the Contracting Government of the port of loading acting on behalf of the Administration, that, in its loaded condition for the intended voyage, the ship complies with the requirements of grain Code. Can a ship load bulk grain without Documents of Authorization as per Grain Code? If Yes, under what condition? The master demonstrates to the satisfaction of the Administration or the Contracting Government of the port of loading on behalf of the Administration that the ship in its proposed loaded condition will comply with the requirements of this section. A ship without such a document shall not load grain until the master satisfies the Administration, or the Contracting Government of the port of loading on behalf of the Administration,that the ship will comply with the requirements of the International Grain Code in its proposed loaded condition. The initial metacentric height, after correction for the free surface effects of liquids in tanks, shall be not less than 0.30 meter. Before loading bulk grain the master shall, if so required by the Contracting Government of the country of the port of loading, demonstrate the ability of the ship at all stages of any voyage to comply with the stability criteria required by this section. After loading, the master shall ensure that the ship is upright before proceeding to sea. All necessary and reasonable trimming shall be performed to level all free grain surfaces and to minimize the effect of grain shifting. In any filled compartment, trimmed, the bulk grain shall be trimmed so as to fill all spaces under the decks and hatch covers to the maximum extent possible. The compartment is “specially suitable” as defined grain code, in which case dispensation may be granted from trimming the ends of that compartment. If there is no bulk grain or other cargo above a lower cargo space containing grain, the hatch covers shall be secured in an approved manner having regard to the mass and permanent arrangements provided for securing such covers. When bulk grain is stowed on top of closed ‘tween-deck hatch covers which are not grain-tight, such covers shall be made grain-tight by taping the joints, covering the entire hatchway with tarpaulins or separation cloths, or other suitable means. After loading, all free grain surfaces in partly filled compartments shall be level. The construction meets the requirements of raincode. Get cargo information from the shipper. Calculate the stability criteria complies with the requirement of International grain code. 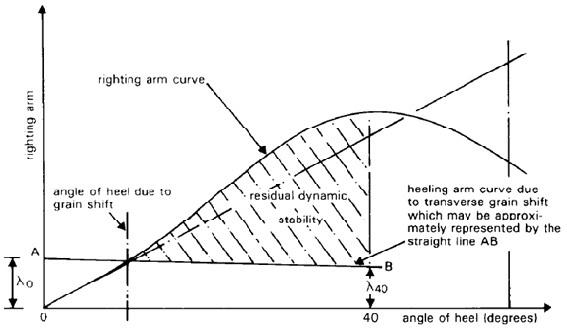 Planning, calculation and loading to be made for ship’s stability at all stages of loading. 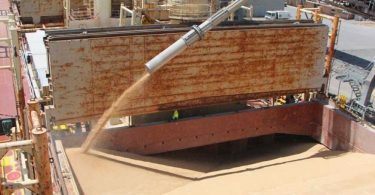 Clean cargo holds for loading grain. Check weather tightness of hatches. Initial draft survey to be carried out before loading grain. Check stresses on hull are within the limit. Check cargo for any sort of damage. Securing cargo as per grain code, to reduce grain heeling moment. All cargo holds to be closed and properly secured. Prevent entering of sea water during adverse weather condition. Most grains have an angle of repose (slip angle) of about 20° from the horizontal, which means that if the ship rolls more than 20° the cargo will shift. Then this happens the ship will develop a large list, lying on her side and still rolling will obviously cause a greater shift of cargo which in turn will capsize the vessel. Filled compartment, trimmed ­ the cargo should be trimmed so that all spaces under deck and hatch covers are filled to the fullest extent possible. If the cargo is stowed only in the lower compartment, the lower compartment hatch covers should be secured in the approved manner. In partly filled compartments, the surface of bulk grain should be secured by over-stowing except in cases where heeling moments due to grain shift have been calculated and taken into consideration for stability of the vessel. Longitudinal divisions may be fitted to reduce heeling moments due to shift of grain in filled compartments, trimmed, filled compartments, untrimmed and partly filled compartments. What is Documents of Authorization as per Grain code? What is Stability requirements for Grain Loading? Thanks for information on Grain Code which was exactly what i was looking for. DEAR IT WAS VERY USEFUL BOLG, APPREACIATE FOR SUCH A SIMPLE DECRIPTION.